Sounds rather shocking, considering the other gift options out there but according to a recent survey of 2,500 U.S. customers, the majority of Americans believe that cookware is the most useful gift for the home and most say that it is a good gift to give for many occasions, like Father's Day. In fact, 44% of men say they never think to ask for cookware as a gift, even though they want it. And why not? With the right cookware even the most casual dad can be a star in the kitchen -- and still have time to actually sit down and enjoy their culinary creation! 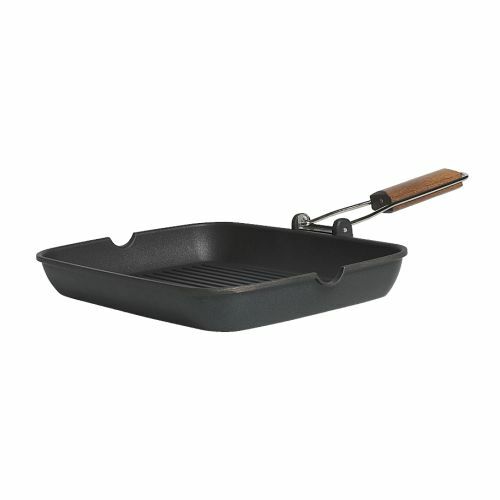 Consider giving the GRILLA Grill Pan from IKEA this Father's Day! It is great for giving those grill lines that Dad loves on his meat and it features DuPont™ Teflon® nonstick coatings, which means foods won’t stick and cleaning is easy! This pan features a thick base that prevents food from easily burning and sticking to the pan but the low weight makes the pan easy to handle, even when filled with food. My favorite feature is the folding handle that really saves space when stored and means it can easily travel with you too! So on a super hot and humid day this summer, save yourself the sweat and grill INSIDE on the GRILLA Grill Pan from IKEA! Buy It: You can purchase the GRILLA Grill Pan for $14.99 from your local IKEA store.